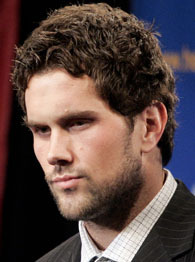 Last month, ESPN.com voters dubbed NFL draft prospect Matt Leinart the Hottest Male Athlete of the Year. With good reason. The SoCal stud stands 6-foot-5, weighs a chiseled 225 (when he's not holding his Heisman) and has sprinkled touchdown passes and national titles all over the sunny streets of La La Land. If they gave out an Oscar for Biggest Man On Campus, Matty would win walking away -- and his impressive armful of lovely lady friends could rival any leading lad's in Hollywood. Knowing all this, we decided to send our own Mary Buckheit -- Page 2 writer and resident Barbie expert -- to crack the core of this Ken doll and ultimately place the crown upon the deserving tresses of this Man of Troy. How did you find out that you, Matt Leinart, are ESPN.com's Hottest Male Athlete? Let's see, I was with my agent, and my publicist called, and we were all having this discussion about things that weren't necessarily good. Then, all of a sudden, my publicist said, "Buh-ht, Matt was voted ESPN.com's Hottest Male Athlete today." I just started laughing. ESPN.com's Hottest Male Athlete prefers shorts and sweats to suit and tie. Laughing? You didn't put your hand to your mouth and tear up? No, but it was definitely flattering. It's just something that I would never expect to win. I didn't even know it was happening. How many votes were there? Over 25,000 people voted on you beefcakes. Your closest competition came from Jeremy Bloom, Dwyane Wade and Dan Wheldon. Think you could best all of those guys on the catwalk? Who do you think is the smoothest-looking guy in sports? Shaq and Kobe are always looking smooth. I saw Dwyane Wade at the ESPYs last year and he was looking good; he's got some fine clothing. All those basketball players come to mind, you know? They always seem to be looking smooth. Must be the dress code. Yeah, I guess it's working. I mean, football-wise, I don't even know. Hoopsters always look smooth. I'm definitely not smooth! I'm definitely not up there with those guys.